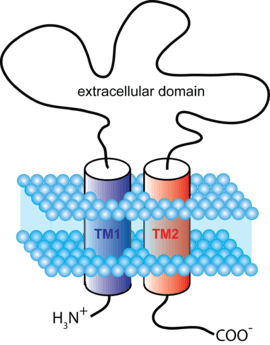 The ATP-gated P2X Receptor Cation Channel (P2X Receptor) Family (TC# 1.A.7) consists of cation-permeable ligand gated ion channels that open in response to the binding of extracellular adenosine 5'-triphosphate (ATP). They belong to a larger family of receptors known as the ENaC/P2X superfamily. ENaC and P2X receptors have similar 3-D structures and are homologous. P2X receptors are present in a diverse array of organisms including humans, mouse, rat, rabbit, chicken, zebrafish, bullfrog, fluke, and amoeba. P2X receptors are expressed in cells from a wide variety of animal tissues. On presynaptic and postsynaptic nerve terminals and glial cells throughout the central, peripheral and autonomic nervous systems, P2X receptors have been shown to modulate synaptic transmission. Furthermore, P2X receptors are able to initiate contraction in cells of the heart muscle, skeletal muscle, and various smooth muscle tissues, including that of the vasculature, vas deferens and urinary bladder. P2X receptors are also expressed on leukocytes, including lymphocytes and macrophages, and are present on blood platelets. There is some degree of subtype specificity as to which P2X receptor subtypes are expressed on specific cell types, with P2X1 receptors being particularly prominent in smooth muscle cells, and P2X2 being widespread throughout the autonomic nervous system. However, such trends are very general and there is considerable overlap in subunit distribution, with most cell types expressing more than one subunits. For example, P2X2 and P2X3 subunits are commonly found co-expressed in sensory neurons, where they often co-assemble into functional P2X2/3 receptors. To date, seven separate genes coding for P2X subunits have been identified, and named to as P2X1 through P2X7, based on their pharmacological properties. The proteins of the P2X receptors are quite similar in sequence (>35% identity), but they possess 380-1000 amino acyl residues per subunit with variability in length. The subunits all share a common topology, possessing two transmembrane domains (one about 30-50 residues from their N-termini, the other near residues 320-340), a large extracellular loop and intracellular carboxyl and amino termini (Figure 1) The extracellular receptor domains between these two segments (of about 270 residues) are well conserved with several conserved glycyl residues and 10 conserved cysteyl residues. The amino termini contain a consensus site for protein kinase C phosphorylation, indicating that the phosphorylation state of P2X subunits may be involved in receptor functioning. Additionally, there is a great deal of variability (25 to 240 residues) in the C termini, indicating that they might serve subunit specific properties. Generally speaking, most subunits can form functional homomeric or heteromeric receptors. Receptor nomenclature dictates that naming is determined by the constituent subunits; e.g. a homomeric P2X receptor made up of only P2X1 subunits is called a P2X1 receptor, and a heteromeric receptor containing P2X2 and P2X3 subunits is called a P2X2/3 receptor. The general consensus is that P2X6 cannot form a functional homomeric receptor and that P2X7 cannot form a functional heteromeric receptor. Topologically, they resemble the epithelial Na+ channel proteins in possessing (a) N- and C-termini localized intracellularly, (b) two putative transmembrane segments, (c) a large extracellular loop domain, and (d) many conserved extracellular cysteyl residues. P2X receptor channels transport small monovalent cations, although some also transport Ca2+. Evidence from early molecular biological and functional studies has strongly indicated that the functional P2X receptor protein is a trimer, with the three peptide subunits arranged around an ion-permeable channel pore. This view was recently confirmed by the use of X-ray crystallography to resolve the three-dimensional structure of the zebrafish P2X4 receptor(Figure 2). These findings indicate that the second transmembrane domain of each subunit lines the ion-conducting pore and is therefore responsible for channel gating. The relationship between the structure and function of P2X receptors has been the subject of considerable research, and key protein domains responsible for regulating ATP binding, ion permeation, pore dilation and desensitization have been identified. Three ATP molecules are thought to be required to activate a P2X receptor, suggesting that ATP needs to bind to each of the three subunits in order to open the channel pore, though recent evidence suggests that ATP binds at the three subunit interfaces. Once ATP binds to the extracellular loop of the P2X receptor, it evokes a conformational change in the structure of the ion channel that results in the opening of the ion-permeable pore. The most commonly accepted theory of channel opening involves the rotation and separation of the second transmembrane domain (TM) helices, allowing cations such as Na+ and Ca2+ to access the ion-conducting pore through three lateral fenestrations above the TM domains. The entry of cations leads to the depolarization of the cell membrane and the activation of various Ca2+-sensitive intracellular processes. The channel opening time is dependent upon the subunit makeup of the receptor. For example, P2X1 and P2X3 receptors desensitize rapidly (a few hundred milliseconds) in the continued presence of ATP, whereas the P2X2 receptor channel remains open for as long as ATP is bound to it. The pharmacology of a given P2X receptor is largely determined by its subunit makeup. Different subunits exhibit different sensitivities to purinergic agonists such as ATP, α,β-meATP and BzATP; and antagonists such as pyridoxalphosphate-6-azophenyl-2',4'-disulphonic acid (PPADS) and suramin. Of continuing interest is the fact that some P2X receptors (P2X2, P2X4, human P2X5, and P2X7) exhibit multiple open states in response to ATP, characterized by a time-dependent increase in the permeabilities of large organic ions such as N-methyl-D-glucamine (NMDG+) and nucleotide binding dyes such as propidium iodide (YO-PRO-1). Whether this change in permeability is due to a widening of the P2X receptor channel pore itself or the opening of a separate ion-permeable pore is the subject of continued investigation. P2X receptors are synthesized in the rough endoplasmic reticulum. After complex glycosylation in the Golgi apparatus, they are transported to the plasma membrane, whereby docking is achieved through specific members of the SNARE protein family. A YXXXK motif in the C terminus is common to all P2X subunits and seems to be important for trafficking and stabilization of P2X receptors in the membrane. Removal of P2X receptors occurs via clathrin-mediated endocytosis of receptors to endosomes where they are sorted into vesicles for degradation or recycling. The sensitivity of P2X receptors to ATP is strongly modulated by changes in extracellular pH and by the presence of heavy metals (e.g. zinc and cadmium). For example, the ATP sensitivity of P2X1, P2X3 and P2X4 receptors is attenuated when the extracellular pH<7, whereas the ATP sensitivity of P2X2 is significantly increased. On the other hand, zinc potentiates ATP-gated currents through P2X2, P2X3 and P2X4, and inhibits currents through P2X1. The allosteric modulation of P2X receptors by pH and metals appears to be conferred by the presence of histidine side chains in the extracellular domain. In contrast to the other members of the P2X receptor family, P2X4 receptors are also very sensitive to modulation by the macrocyclic lactone, ivermectin. Ivermectin potentiates ATP-gated currents through P2X4 receptors by increasing the open probability of the channel in the presence of ATP, which it appears to do by interacting with the transmembrane domains from within the lipid bilayer. 1 2 3 4 5 6 7 8 North RA (2002). "Molecular physiology of P2X receptors". Physiol. Rev. 82 (4): 1013–67. doi:10.1152/physrev.00015.2002 (inactive 2015-01-09). PMID 12270951. ↑ Khakh BS, North RA (2006). "P2X receptors as cell-surface ATP sensors in health and disease". Nature. 442 (7102): 527–32. doi:10.1038/nature04886. PMID 16885977. ↑ Vassort G (2001). "Adenosine 5'-triphosphate: a P2-purinergic agonist in the myocardium". Physiol. Rev. 81 (2): 767–806. PMID 11274344. ↑ Chizh BA, Illes P (2001). "P2X receptors and nociception". Pharmacol. Rev. 53 (4): 553–68. PMID 11734618. ↑ Fowler CJ, Griffiths D, de Groat WC (2008). "The neural control of micturition". Nat Rev Neurosci. 9 (6): 453–466. doi:10.1038/nrn2401. PMC 2897743 . PMID 18490916. ↑ Gachet C (2006). "Regulation of Platelet Functions by P2 Receptors". Annual Review of Pharmacology and Toxicology. 46: 277–300. doi:10.1146/annurev.pharmtox.46.120604.141207. PMID 16402906. ↑ Wewers MD, Sarkar A (2009). "P2X7 receptor and macrophage function". Purinergic Signalling. 5 (2): 189–195. doi:10.1007/s11302-009-9131-9. PMC 2686821 . PMID 19214778. ↑ Kawano A, Tsukimoto M, Noguchi T, Hotta N, Harada H, Takenouchi T, Kitani H, Kojima S (2012). "Involvement of P2X4 receptor in P2X7 receptor-dependent cell death of mouse macrophages". Biochemical and Biophysical Research Communications. 419 (2): 374–380. doi:10.1016/j.bbrc.2012.01.156. PMID 22349510. ↑ Burnstock G (2013). "Introduction to Purinergic Signalling in the Brain". Advances in Experimental Medicine and Biology. 986: 1–12. doi:10.1007/978-94-007-4719-7_1. ISBN 978-94-007-4718-0. PMID 22879061. ↑ Burnstock G (2000). "P2X receptors in sensory neurones". Br J Anaesth. 84 (4): 476–88. doi:10.1093/oxfordjournals.bja.a013473. PMID 10823099. 1 2 Gever JR, Cockayne DA, Dillon MP, Burnstock G, Ford AP (2006). "Pharmacology of P2X channels". Pflugers Arch. 452 (5): 513–37. doi:10.1007/s00424-006-0070-9. PMID 16649055. 1 2 North RA (2002). "Molecular physiology of P2X receptors". Physiological reviews. 82 (4): 1013–1067. doi:10.1152/physrev.00015.2002. PMID 12270951. ↑ Boué-Grabot E, Archambault V, Séguéla P (2000). "A protein kinase C site highly conserved in P2X subunits controls the desensitization kinetics of P2X(2) ATP-gated channels". The Journal of Biological Chemistry. 275 (14): 10190–10195. doi:10.1074/jbc.275.14.10190. PMID 10744703. ↑ Surprenant A, North RA (2009). "Signaling at Purinergic P2X Receptors". Annual Review of Physiology. 71: 333–359. doi:10.1146/annurev.physiol.70.113006.100630. PMID 18851707. 1 2 Kaczmarek-Hájek K, Lörinczi E, Hausmann R, Nicke A (2012). "Molecular and functional properties of P2X receptors—recent progress and persisting challenges". Purinergic Signalling. 8 (3): 375–417. doi:10.1007/s11302-012-9314-7. PMC 3360091 . PMID 22547202. ↑ Barrera NP, Ormond SJ, Henderson RM, Murrell-Lagnado RD, Edwardson JM (2005). "Atomic Force Microscopy Imaging Demonstrates that P2X2 Receptors Are Trimers but That P2X6 Receptor Subunits Do Not Oligomerize". Journal of Biological Chemistry. 280 (11): 10759–10765. doi:10.1074/jbc.M412265200. PMID 15657042. ↑ Torres GE, Egan TM, Voigt MM (1999). "Hetero-oligomeric assembly of P2X receptor subunits. Specificities exist with regard to possible partners". The Journal of Biological Chemistry. 274 (10): 6653–6659. doi:10.1074/jbc.274.10.6653. PMID 10037762. ↑ US Lapsed 6498022, Yale University School Of Medicine, "Isolated nucleic acid molecules encoding human carbonate transporter proteins, and uses thereof", assigned to Applera Corporation, Connecticut This article incorporates text from this source, which is in the public domain. ↑ Nicke A, Bäumert HG, Rettinger J, Eichele A, Lambrecht G, Mutschler E, Schmalzing G (1998). "P2X1 and P2X3 receptors form stable trimers: a novel structural motif of ligand-gated ion channels". EMBO J. 17 (11): 3016–28. doi:10.1093/emboj/17.11.3016. PMC 1170641 . PMID 9606184. ↑ Kawate T, Michel JC, Birdsong WT, Gouaux E (2009). "Crystal structure of the ATP-gated P2X4 ion channel in the closed state". Nature. 460 (7255): 592–598. doi:10.1038/nature08198. PMC 2720809 . PMID 19641588. ↑ Migita K, Haines WR, Voigt MM, Egan TM (2001). "Polar Residues of the Second Transmembrane Domain Influence Cation Permeability of the ATP-gated P2X2 Receptor". Journal of Biological Chemistry. 276 (33): 30934–30941. doi:10.1074/jbc.M103366200. PMID 11402044. ↑ Egan TM, Samways DS, Li Z (2006). "Biophysics of P2X receptors". Pflugers Arch. 452 (5): 501–12. doi:10.1007/s00424-006-0078-1. PMID 16708237. ↑ Roberts JA, Vial C, Digby HR, Agboh KC, Wen H, Atterbury-Thomas A, Evans RJ (2006). "Molecular properties of P2X receptors". Pflugers Arch. 452 (5): 486–500. doi:10.1007/s00424-006-0073-6. PMID 16607539. ↑ Evans RJ (2008). "Orthosteric and allosteric binding sites of P2X receptors". Eur. Biophys. J. 38 (3): 319–27. doi:10.1007/s00249-008-0275-2. PMID 18247022. ↑ Ding S, Sachs F (1999). "Single channel properties of P2X2 purinoceptors". The Journal of General Physiology. 113 (5): 695–720. doi:10.1085/jgp.113.5.695. PMC 2222910 . PMID 10228183. ↑ Cao L, Broomhead HE, Young MT, North RA (2009). "Polar Residues in the Second Transmembrane Domain of the Rat P2X2 Receptor That Affect Spontaneous Gating, Unitary Conductance, and Rectification". Journal of Neuroscience. 29 (45): 14257–14264. doi:10.1523/JNEUROSCI.4403-09.2009. PMC 2804292 . PMID 19906973. ↑ Kawate T, Robertson JL, Li M, Silberberg SD, Swartz KJ (2011). "Ion access pathway to the transmembrane pore in P2X receptor channels". The Journal of General Physiology. 137 (6): 579–590. doi:10.1085/jgp.201010593. PMC 3105519 . PMID 21624948. ↑ Shigetomi E, Kato F (2004). "Action Potential-Independent Release of Glutamate by Ca2+ Entry through Presynaptic P2X Receptors Elicits Postsynaptic Firing in the Brainstem Autonomic Network". Journal of Neuroscience. 24 (12): 3125–3135. doi:10.1523/JNEUROSCI.0090-04.2004. PMID 15044552. ↑ Koshimizu TA, Van Goor F, Tomić M, Wong AO, Tanoue A, Tsujimoto G, Stojilkovic SS (2000). "Characterization of calcium signaling by purinergic receptor-channels expressed in excitable cells". Molecular Pharmacology. 58 (5): 936–945. PMID 11040040. ↑ Chaumont S, Jiang LH, Penna A, North RA, Rassendren F (2004). "Identification of a Trafficking Motif Involved in the Stabilization and Polarization of P2X Receptors". Journal of Biological Chemistry. 279 (28): 29628–29638. doi:10.1074/jbc.M403940200. PMID 15126501. ↑ Royle SJ, Bobanović LK, Murrell-Lagnado RD (2002). "Identification of a Non-canonical Tyrosine-based Endocytic Motif in an Ionotropic Receptor". Journal of Biological Chemistry. 277 (38): 35378–35385. doi:10.1074/jbc.M204844200. PMID 12105201. ↑ Khakh BS, Proctor WR, Dunwiddie TV, Labarca C, Lester HA (1999). "Allosteric control of gating and kinetics at P2X(4) receptor channels". J. Neurosci. 19 (17): 7289–99. PMID 10460235. ↑ Priel A, Silberberg SD (2004). "Mechanism of ivermectin facilitation of human P2X4 receptor channels". J. Gen. Physiol. 123 (3): 281–93. doi:10.1085/jgp.200308986. PMC 2217454 . PMID 14769846. As of this edit, this article uses content from "1.A.7 ATP-gated P2X Receptor Cation Channel (P2X Receptor) Family", which is licensed in a way that permits reuse under the Creative Commons Attribution-ShareAlike 3.0 Unported License, but not under the GFDL. All relevant terms must be followed.